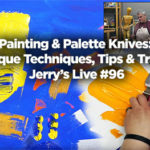 Hello to all my artist friends.Â We just returned home from a great workshop and trade show in Houston and it is time to get some painting in while getting ready for up coming workshops, the next being a one day painting demonstrations followed by a one day workshop at the Jerry’s Artarama store in Nashville TN. Maybe I’ll see you there. We all need to refresh and stay excited about our painting experience.Â I have several things I do to stay excited.Â Something as simple as trying a new paint color and seeing how it mixes with other colors in my palette, then using it in a painting gets me charged.Â I just found one, I use Rembrandt’s Artist WatercolorsÂ Naples Yellow Red and mixed it with Lemon Yellow, then Permanent Red Light, then Quinacridone Rose. WOW such beautiful warm colors. Other ways to stay excited are trying a new surface. 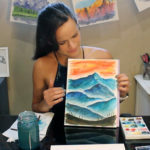 If you are used to painting on Arches cold press watercolor sheets try a different surface such as rough or hot press or try watercolor blocks or arches new watercolor boards, which comes in all you favorite sizes and surfaces. 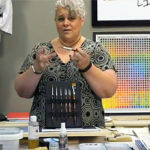 With this product you do not need a backing when you frame the painting.Â You save money on backing, and the surfaces are less expensive than buying sheets. Another way I stay excited is to call an artist friend often and talk about art.Â While it is not always possible to paint on location, try to go out with an artist friend once a week to photograph new references or paint a small painting on location, 5 x 7 inches or just sketch. Watch your favorite artist DVDs, look at books or surround yourself with your art work or the art work of your favorite artist. 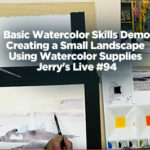 If you go to my website and click on free art lessons you will find a number of short specific lessons in painting and from there you can go to Jerry’s Artarama site for over 550 free art lessons.Â Free is good. Also, check out my Workshop Adventures on my website and have fun painting in some of the most beautiful locations imaginable. Remember life is precious, so take time for yourself. 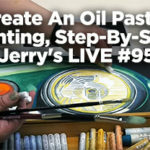 Join me in beautiful Sedona, AZ for a week of not stop fun and painting adventure, guaranteed to get you excited. In closing let me remind you that you are always a better painter than you think you are.